The central motif is a portrait of Jefferson Davis, designed and line engraved on steel by John Archer, and then transferred to a copper plate. It is a side view of Davis that bears a striking resemblance to Abraham Lincoln. Legend has it that Varina Davis (1826-1906) objected to that likeness and asked that it be discontinued. More likely, the copper plate indicates that this issue was produced as a trial or experiment as it was known that copper plates did not wear well. It is estimated that there were only 500,000 stamps printed from a plate of one hundred. This number has been recently lowered from prior beliefs. There is no imprint and no gutter copies are known. Well into the second century after they were produced, surely gutter copies would have been found had the plate been of 200 subjects as speculated in the past. Plating is not complete. These imperforate stamps were printed on white wove paper of varying thickness with colorless gum. The earliest recorded date of use is April 23, 1863. Colors vary from milky blue, blue, light blue, and gray blue. 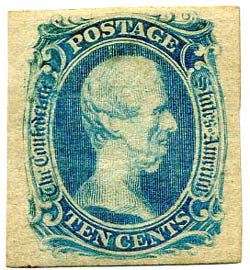 The most typical use was to pay the ten-cent letter rate. Students refer to this issue as the “TEE-EE-NN” to distinguish it from the Type I and II designs, with the value in numerals as opposed to being spelled out.